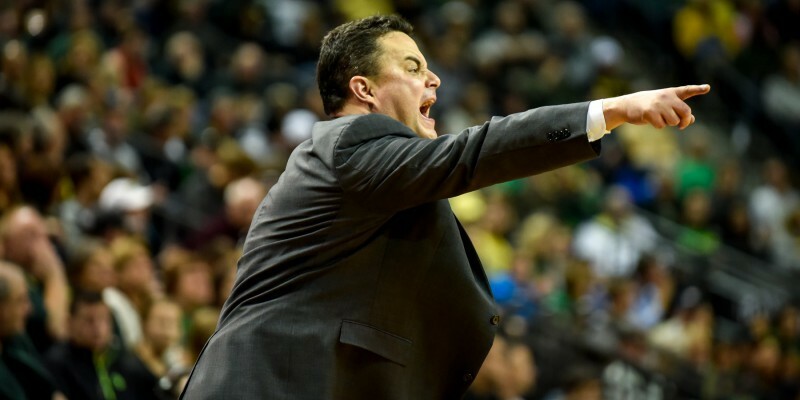 Last night the Oregon Ducks men’s basketball team played the Arizona Wildcats in Tucson, Arizona. It was a tough night for the Ducks — no matter what they did they could never quite catch up with the Wildcats. Going into halftime the Ducks really struggled, and the half ended with Arizona’s T.J. McConnell slamming down a hard dunk to bring the score to 27-42, Wildcats. Throughout the entire first half the game was somewhat sloppy. Although both teams ended the first half with eight turnovers each, the Ducks’ shots hit the backboard more times than a team would ever want and the Wildcats had a 15-point lead over them. Oregon was at 42% for field goals and Arizona was at 60%. When Oregon’s head coach Dana Altman was asked what the Ducks needed to improve on the most going into the second half he said that they definitely needed to work on rebounding, but the Wildcats were beating his men out in every aspect and there were a variety of adjustments that needed to be made. Redshirt junior forward Elgin Cook in game against the Arizona Wildcats earlier this season. In the first half, Elgin Cook had 13 points and three rebounds and was proving to be the MVP for the Ducks. Joseph Young, the Ducks go-to man on the court, had five points and one steal. As the Ducks took the court in the second half Elgin Cook came out hot with a three to get the game going. Unfortunately, the Ducks were unable to keep up with the Wildcats for almost the entire game. With 12 minutes left in the game the Ducks went on an 8-0 run over Arizona and brought the score to 46-56, Wildcats. If there was one player for the Wildcats that the Ducks couldn’t stop it was senior guard T.J. McConnell. Whether it be shooting, assists, rebounding or dunking McConnell took care of it and Oregon couldn’t put an end to it no matter what. In the last two minutes of the game the Ducks were down a dreadful amount and tried to get as many points on the board as they could, but their shot choices were hasty and not reasonable. Cook finished the game with 16 points, four rebound and two assists. The Ducks had 20 rebounds throughout the game and the Wildcats had 34. The Ducks also had 16 turnovers to the Wildcats’ 10 turnovers. The final score was Oregon 56, Arizona 90. The Wildcats are a very good team with a 19-2 record on the season and a 33-home-game winning streak. The Ducks will be playing their next game this Friday against Arizona State in Tempe, Arizona. Last time the Ducks played the Sun Devils they won by three in a nail-biting game. Tune in to see how the Ducks handle the other Arizona team this Friday evening!